A juxtaposition between events ending 2012 in the US, and those in Ontario. Wasn't the Korean Consortium supposed to have 4 plants running in Ontairo by now as part of it's sweatheart deal with the government? While 3 of those plants exist (with less than anticipated employment), the fourth remains a promise - promised again in July 2012, with, most recently, London politician and maligned Minister of Energy Bentley noting in November that the plans are still "on track." Shunted aside to a forgotten area of a forgotten depot - but on track. All over the country, developers are in a sprint to get new wind farms up and running before Tuesday, when the federal wind production tax credit will disappear like Cinderella’s ball gown. After that, the nation’s wind-farm building will be at a virtual standstill. The stakes of meeting the deadline are enormous. Wind turbines that are connected to the grid and in commercial service before midnight on New Year’s Eve are entitled to a 2.2 cent tax credit for each kilowatt-hour they generate in their first 10 years, which comes out to about $1 million for a big turbine. As it stands now, those that enter service on Jan. 1 or later are out of luck. The deadline is a bit like the April 15 one for filing income taxes, but “there are no extensions here,” said Paul Copleman, a spokesman for Iberdrola. A small-scale CC(S is pending) project in Australia has been completed, with funding from the Japanese goverment. The coal industry says it has made a giant step forward with the opening of Australia's first 'clean coal' carbon capture plant. The $200 million Callide Oxyfuel project, launched on the weekend, will trap greenhouse gas generated by CS Energy's Callide A coal-fired power station in Biloela, central Queensland. The project, which is backed by the Japanese government, is designed to test the viability of clean coal technology under Australian conditions. Project director Chris Spero says the plant uses an oxyfuel combustion process, which burns coal with pure oxygen for less waste; then traps and stores the greenhouse gases rather than releasing them into the atmosphere. "This project is designed to catch over 85 per cent of the CO2, of the flue gases being treated," he told AM. The rural power plant generates 30 megawatts, only enough to power about 30,000 homes, but it will test of the viability of retrofitting existing power stations with the technology. With regional prices for natural gas far below levels expected by the historical linkage to crude pricing, the gas-to-liquids technology is intriguing. The New York Times provides an article with prospective new plants in the United States, but also with warnings that the technology may not be nearly as promising as it's promoters suggest. ...the record for converting gas to liquids is spotty. The newest and largest plant in operation, Royal Dutch Shell’s giant Pearl plant, also in Qatar, cost the leviathan sum of $19 billion, more than three times its original projected cost, and has been plagued with unexpected maintenance problems. BP and ConocoPhillips built and briefly operated demonstration plants in Alaska and Oklahoma, but stopped short of full development of the technology. Exxon Mobil and ConocoPhillips announced plans to build giant plants in Qatar, but backed out, putting their capital instead into terminals to export liquefied natural gas. Many analysts and industry insiders say the technology makes sense only when oil and gas supplies and prices are far out of balance, as they are today in Qatar and the United States. When oil and gas come into alignment, gas-to-liquids ventures will become white elephants, these skeptics say. Environmentalists also say that the huge energy inputs required to transform natural gas into diesel or other fuels negate any greenhouse gas benefits. A lot of news related to natural gas in the past week, including the UK's blesssing of hydraulic fracturing exploration (fracking), and an S&P downgrade of British Columbia, of carbon tax fame, based significantly on that government's declining revenue from coal and natural gas industries. Opponents of infrastructure to enable exporting can draw on oil sands opposition, which has served to make oil cheaper in North America than elsewhere, although the discrepancy is much smaller than it is for natural gas. This is likely to serve as another reason for those wishing to profit from the reindustrialization of North America based on plentiful gas feedstocks to fiance sorta green groups in opposition of exporting. The Oil Drum's Drumbeat on Friday opened with citing an argument for taxing natural gas, With a natural gas tax, everyone can benefit argues that allowing exports of liquified natural gas (LNG) would drive up the domestic price - much better to just slap on a tax to drive up the domestic price. (disregarding the fact that higher prices to suppliers are incentive to create more product, and higher prices to consumers an incentive to consume less product - ie. the trade should grow American industry, and the tax should shrink it). Today the UK government moved to allow fracking (Hydraulic fracturing) with the hopes of plentiful supply being recovered. A brief exchange of pros and cons is at the Guardian with statements from Mark Lynas (for) and Greenpeace's David Santillo (against). The article seems unfair as Lynas knows particulars and Santillo knows no particulars but demands more be known - but perhaps Lynas simply has a much stronger position to argue. Other 'environmentalist' wanted to change the channel to a claim of lower costs for renewables, and another Guardian article appeared, Gas 'will add more to energy bills than renewables' – government advisers. The original story was quite wrong, using figures for a scenario where a £500/tCO2 existed, in 2050, to report on what would happen 'by the end of the decade'. The tweets that exploded from the ENGO twitterverse are being quickly deleted now. Recently S&P downgraded Ontario Power Generation, partly because of it's negative percption of OPG's "capital expenditure in a regulatory context, which provides limited cash flow relief during construction for multiyear projects..."
The article cited here provides insight into an alternate 'regulatory context' - in Florida. Over the past several years, Florida's nuclear cost recovery statute has allowed FPL to upgrade our existing nuclear plants and add over 500 new megawatts of clean, cost-effective power-generation to our fleet. To put this in perspective, this is about the same amount of electricity generated by a medium-sized nuclear power plant without having to build one. ...the reality is continued investment in nuclear power is good for FPL customers, for the environment and for our state. To this end, FPL isn't just talking about protecting consumers from higher energy costs and preserving our environment for future generations, we are continuing to take action to do so today and for generations to come. The LA Times has an informative article on the need for increased capacity reserves due to increased requirements for production from intermittent generators. The Delta Energy Center, a power plant about an hour outside San Francisco, was roaring at nearly full bore one day last month, its four gas and steam turbines churning out 880 megawatts of electricity to the California grid. On the horizon, across an industrial shipping channel on the Sacramento-San Joaquin River Delta, scores of wind turbines stood dead still. The air was too calm to turn their blades — or many others across the state that day. Wind provided just 33 megawatts of power statewide in the midafternoon, less than 1% of the potential from wind farms capable of producing 4,000 megawatts of electricity. One of the hidden costs of solar and wind power — and a problem the state is not yet prepared to meet — is that wind and solar energy must be backed up by other sources, typically gas-fired generators. Continue Reading at the LA Times ... and ignore the 'typically gas-fired generators' part as Europe's heavier penetration of renewables is coincident with a resurgence in coal-fired generation there. 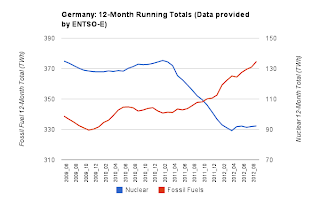 Bloomberg reports on outcomes of Germany's Energiewende, but it's diagnosis leaves something to be desired. Other generators do not compete with "renewables" as the latter are guaranteed space on the grid whenever it is possible. The feed-in tariff (FIT) procurement method spikes supply (thus dropping price) with intermittent renewables, and the subsequent output of renewables acts to essentially lower demand for traditional suppliers. 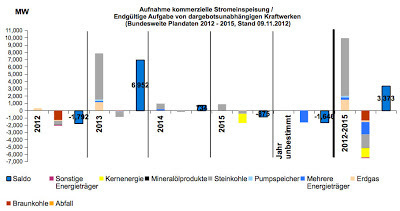 In Germany smaller consumers pay for the FIT contracts, while large industry is exempt. Germany’s largest power generator is emerging as the biggest loser in the country’s shift to renewable energy. EON SE, the worst-performing stock in Germany’s benchmark DAX index (DAX) for the first year since the company was formed in 2000, has ripped up earnings forecasts as a surfeit of electricity from wind turbines and solar panels makes its fleet of gas-fired plants unprofitable. 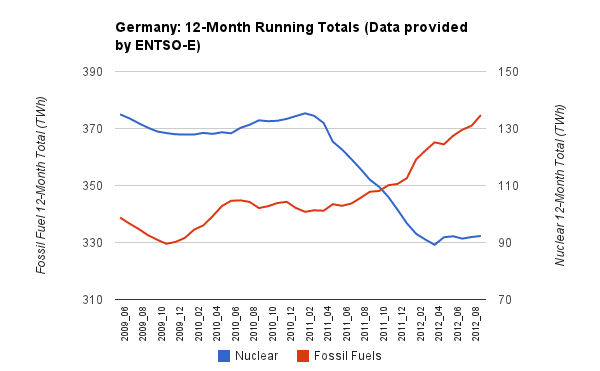 In contrast, RWE AG (RWE) has gained 16 percent because EON’s closest rival has more cheap-to-run coal stations better able to compete with renewables. The EPA estimates that both the Fusion Hybrid and C-Max Hybrid get 47 miles per gallon in both city and highway driving. In Consumer Reports testing, the Fusion Hybrid got 35 mpg in city driving and 41 on the highway. That works out to 8 mpg less than EPA estimates in combined city and highway driving. The C-Max hybrid, meanwhile, got 35 mpg in city driving and 38 on the highway in the Consumer Reports test. That's 10 mpg less than EPA estimates in combined driving. "This is the biggest discrepancy of any current model," said Jake Fisher, head of auto testing at Consumer Reports. But this probably isn't the important story - it seems that driving style impacts fuel consumption most in the vehicles that can be most efficient, as the story at CNN goes on to imply. A couple of reports are out that score performance in climate and/or energy policies. The Climate Change Performance Performance Index 2013 scores Canada right near the bottom - in the 58th out of 61 places. The Climate Action network(CAN) Canada (CAN) site announced "Canada ranked as worst performer in the developed world on climate change." The top 3 spots were left empty because none of the f&^*'n countries deserve a medal. Elsewhere, the World Energy council organization released "Policies for the future: 2011 Assessment of country energy and climate policies." Canada was in 5th position, behind Switzerland, Sweden, France and Germany. Two stories leading to a future one. Ontario's Minister of Energy is ratcheting up the excitement over an electricity pricing incentive to lure new industry. Bentley said at the outset larger industries will be invited to take advantage of the program, which will provide electricity at a discounted price. The program will eventually be made available to smaller firms. Although details of the program were sketchy, Bentley said it will offer two-thirds off the regular price of electricity to companies willing to start up a second or third shift to create jobs. The entire article can be read at The Chatham Daily News. The background is that continued contracting of supply, particularly intermittent renewable supply, continues to drive up total cost while driving down the market, HOEP, rate; which has lead to the current situation where 2/3rd's of the commodity charge in Ontario is for the 'global adjustment' charge which recovers the full cost of contracts from ratepayers, and a charge now being manipulated to drive down price for industry. ...meanwhile in the land that dictated Ontario's Feed-in Tariff Policies, Germany, the pricing scheme is under threat from European trade watchdogs, because the EEG (the mechanism through which the cost of contracts is recovered from ratepayers) is now heavily gamed to exclude more and more industry - taking it from being tolerated to being increasingly seen as a subsidy. What are we to make of the bizarre events in Whitehall where the prime minister has personally intervened to block the appointment of David Kennedy, the highly respected head of the Committee on Climate Change who had been chosen by a formal civil service process as permanent secretary of the troubled Department of Energy Climate Change. I feel very sorry for the civil servants involved. Mr Kennedy has had a lucky escape but they have to continue to try to do professional jobs in an institution ridiculed by the rest of Whitehall, untrusted to appoint its own staff and destabilised by the atmosphere of distrust between its own ministers. For the energy industry, the bigger message is that the energy department is still a very volatile and political place. The measures announced in the energy bill will be reviewed again after the election – with the clear implication that they are likely to be changed if the political complexion of the government changes. The department has no permanent secretary and no permanent policy. 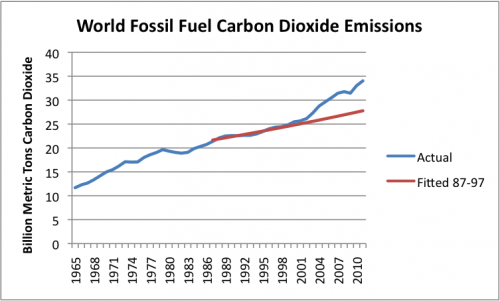 Aside from submitting to the tendency to cheer every failed emissions policy as a noble and necessary misstep taken on the proper path, this is an excellent article on surging emissions after the Kyoto protocol was signed. ...reductions made under the treaty were dwarfed by the rise in emissions not covered by the accord, especially in Asia. Since 2000, CO2 emissions in China have nearly tripled to almost 10 billion tonnes, and those in India have doubled to around 2 billion tonnes. The rise in Asian emissions is partly a result of the migration of heavy industry from developed nations to developing countries, which make products that then get shipped back to wealthy nations. Between 1990 and 2010, the emissions embodied in such products grew by an average of 10% per year — to an annual total of 1.4 billion tonnes — surpassing the total emissions reductions achieved under Kyoto, says Glen Peters, a climate-policy researcher at the Center for International Climate and Environmental Research — Oslo. The gains made by the treaty were therefore deceptive, says David Victor, an energy-policy researcher at the University of California, San Diego. The treaty, he adds, was based on “dubious economic assumptions and flawed accounting systems”. The Council for Clean & Reliable Electricity has a guest commentary by Steven Lightfoot; "Hope is not enough - Inspiring better energy policy"
Hope-driven energy policy is all around us. The governments of Ontario, Germany, Spain, California and countless others have provided large financial incentives to develop their green energy industries and increase their use of intermittent renewable energy, despite mounting evidence that these initiatives are ineffective from a cost, operational and even emissions point of view. For residents of the Greater Toronto Area, a monument to hope has become part of the Toronto skyline. The WindShare Ex Place wind turbine, on the Exhibition Place grounds near Lake Ontario, will never produce any meaningful amount of electricity. What it does do, for better, and likely worse, is to remind the general public that wind turbines exist. Citizens who “want to believe” will be continually encouraged by its presence. Jack Layton, a master of hopeful rhetoric and a disciple of Lovins, was one its key proponents. The number of issues packed into this brief quote from the German Energy Blog is exceptional. 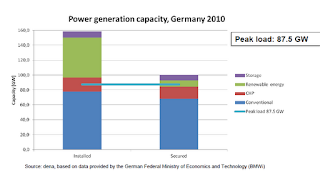 Germany saw another strong expansion of volatile renewable power plant capacity, in particular solar power plant capacity. The growing share of renewable power has to be purchased and transmitted with priority by the grid operators, and is remunerated with fixed feed-in tariffs pursuant Renewable Energy Sources Act (EEG). This has rendered the construction of new conventional power plants that can balance the fluctuating input of green electricity less and less attractive, as the operating times for these plants are continually decreasing. Renewable power plant capacity not subject to competition meanwhile amounts to 68 GW, compared to over 105 GW of conventional capacity that has to compete for market share. Harper has weakened some environmental regulations, including fast-tracking permit reviews of oil sands pipelines and mines. He has also pulled Canada from the Kyoto Protocol, the global treaty to limit greenhouse gas emissions, and appointed climate skeptics to head scientific agencies, including the Natural Sciences and Engineering Research Council, whose work benefits industry. Canada's natural resources expansion plans are "driving absolutely everything in the country right now," said Tom Duck, an atmospheric scientist at Dalhousie University in Nova Scotia. "Our capacity to do environmental science is being rapidly destroyed. We're hemorrhaging scientists here." Canada has an highly educated, or at least highly credentialed, workforce, and average research & development spending. The concern has been in translating these characteristics to better connect R&D with industry. The electricity industry has been purposely reshaped via neoliberal ideology from a system of public subsidy, public profit into public subsidy, private profit where risks and costs are socialised but profits and power are privatised. Industry today is like a restaurant menu: there are multiple retailers, offering a variety of plans and prices that appears to offer consumer choice. Unfortunately, none of the options available include inexpensive electricity. Citizens and customers have no influence over how the menu is constructed; instead, they are offered the illusion of choice. The business model that retailers operate under is inefficient and does not serve consumers well. Also, industry works to silence those who speak out against it. Much like the privatisation and deregulation of the financial sector that promised choice and efficiency according to pseudo-scientific economic models, it has instead resulted in endless financial disasters, coming after a period of apparent tranquillity. The costs to governments vastly exceed all the costs and problems of public ownership. Polish Minister PillowTalkski demonstrates why carbon taxes are opposed - with the revenues not being used to reduce emissions in the most efficient manner, but to fund a renewables industry high on promises and low on accomplishments. "Poland's ministries of finance and economy are at war over where to direct funds raised from fees paid by greenhouse gas emitters, marking a fresh hurdle in the country's efforts to pass controversial new renewables legislation." The ministry of economy wrote the draft renewables law so that revenue from emissions would flow towards green investment, via the National Fund for Environmental Protection and Water Management. The payment amounted to around 700m zlotys ($217 million) in 2011. But the finance ministry has made it known that wants to divert the carbon revenues into the central budget, according to Janusz Pilitowski, head of the renewables department at the economy ministry. The clash is the latest conflict between ministries, local utilities and the wind energy lobby as the coal-dependent nation seeks to optimise the stream of renewables investment. "The finance ministry's demand for the money is unacceptable, because these are funds that are in a sense dedicated to renewable energy," Pilitowski told a wind sector seminar. "I appeal to you to support the economy ministry in this case, irrespective of the earlier wave of criticism." A November 11th op-ed by Dieter Helm, professor of energy policy at Oxford, laid out arguments for a carbon tax, and investment in 'new technologies"- arguments that have been re-broadcasts by many this month. Putting a price on carbon is fundamental. If consumers and businesses do not bear the cost of their carbon pollution, they won’t do much about it. This carbon price should not discriminate between locations: global warming is global. If China does not put a price on carbon, and Europe does, then China will effectively receive a huge export subsidy. The good news is that many new energy technologies are coming down the track: next-generation solar, geothermal and even nuclear technologies, and methods to harness the energy of gravity via the ocean’s tides. There have been major breakthroughs in solar. Work is also under way to develop better energy-storing batteries, smart grids and electric cars. All of those advancements will need public support. What is missing across Europe, the United States and China is a global agreement on a proper carbon price. More than any other measure, a tax on carbon consumption is what’s needed to slow the warming of the planet. I posted some of my thoughts on a carbon tax on my original content blog - I did not address the idea of taxing carbon at the point of consumption, which would be a logistical nightmare. Bloomberg Businessweek has reproduced an Inside Climate News article - the quality is poor. 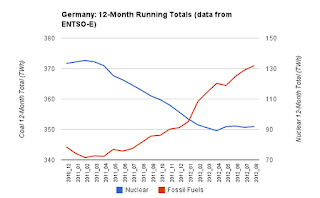 Some analysts suggested that Germany's carbon emissions—which declined by 2 percent in 2011—could have dropped even further if Merkel hadn't acted so precipitously. 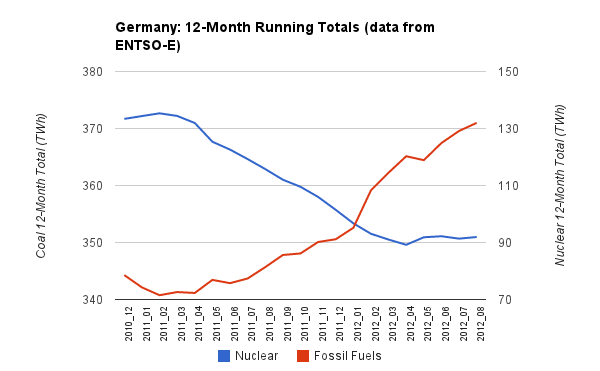 Even with the Merkel shutdown, however, Germany's old coal plants are being decommissioned faster than new ones—which were ordered years before the Fukushima disaster—are coming online. Aside from the emissions reduction not being in the electricity generation sector, and one mild year not being a test, more coal plants are planned to come online than go offline. Medical Check-ups: The Unexpected, and the expected? The Globe and Mail report on an agreement between the Ontario government and the province's doctors includes a report that annual check-ups can do more harm than good. So they'll be done annually, but less thoroughly, in Ontario going forward. A recent Danish study concluded doctors should stop offering annual physicals because they don’t appear to reduce deaths from cancer or heart disease but can add to stress levels. Researchers at the Nordic Cochrane Centre in Copenhagen pooled data from 14 studies that included more than 180,000 people who were randomly assigned to a group that was asked to get regular checkups or one that saw a doctor only as needed. “With the large number of participants and deaths included, the long follow-up periods used, and considering that cardiovascular and cancer mortality were not reduced, general health checks are unlikely to be beneficial,” concluded the authors. The OMA is expected to help find $100-million worth of savings in the health care system to offset an increase in the total compensation package for the 25,000 doctors it represents. The Globe expects the doctors will find $100 million a year in savings, and the Globe's Queen's Park columnist opines this is a great move towards 'sustainability' . Coincidentally, I had just written on people who justify all sorts of things with the 'sustainability' term. Bloomberg has an extensive article on natural gas supplies/pricing today. -inventories again soar and price looks set to drop again. Embarrassingly, Canadian analyst don't understand why companies would keep producing instead of colluding to drive up prices. Interestingly, the report indicates that in the Bakken field, the capacity doesn't exist to capture all the gas being extracted along with the very valuable oil, so much of the gas is simply burned off. ... the fuel began a slide Oct. 30, falling 9.2 percent percent by Nov. 12 as stockpiles swelled to an all-time high this month, valued at about $15 billion using the current spot price. Gas production in 2013 is expected to match this year’s record level, the U.S. Energy Information Administration forecast this month." The rebound stalled as Chesapeake, the second-biggest U.S. producer, and rivals added output in areas such as the Marcellus Shale in Pennsylvania. ConocoPhillips and Encana Corp. (ECA) brought back curtailed output. Some producers that struggled when the fuel hit a 10-year low in April are opening new wells, dashing hopes by others that a depressed rig count would boost prices. “Unfortunately all the players in this game don’t read by the same Bible,” said Peter Howard, chief executive officer of the Canadian Energy Research Institute in Calgary. Producers need to keep gas wells shut and “force the price up,” he said. As Noted in my previous post, investors continue to lose faith in the profitability of traditional European generation companies - because the companies have reduced prospects of being profitable without outperforming renewables in the search for non-market revenues (aka, by some, subsidies). The huge challenges confronting European utilities were hammered home as E.ON put its mid-term earnings targets under review, citing stiff headwinds for its traditional power-generation business in the absence of capacity mechanisms for back-up plants. Nearly €3bn ($3.8bn) was erased from E.ON’s market capitalisation as shares fell more than 10% on 13 November on the update. E.ON, by some accounts the world’s largest non-state energy utility, insists it will meet the updated 2012 forecast it issued in August. However, its guidance for next year no longer seems achievable “considering the substantial economic uncertainties and the structural changes in the energy industry” in Europe, according to chief executive Johannes Teyssen. Moody's cites a 'new paradigm' for European utilities. What could this "new paradigm be called? London, 06 November 2012 -- Further expected increases in renewable energy will continue to erode the credit quality of European thermal generation companies in the near to medium term, says Moody's Investors Service in a Special Comment published today." When the Point Lepreau generating station in New Brunswick was shut down in March 2008, NB Power officials said the refurbishment would span 18 months and cost $1.4 billion. More than four years and another billion dollars later, the provincial Crown utility company is hoping the repairs will extend the plant's life by 27 years, supplying about one-third of New Brunswick's power needs. "Point Lepreau will be a valuable asset and a great investment for $2.4 billion," NB Power president Gaetan Thomas said in an interview. "We are still going to be able to produce clean energy from Point Lepreau -- over 700 megawatts -- for less than nine cents per kilowatt hour and that makes it a very competitive option." Funny how the same old folks are pursued for quotes year after year. The design is intrinsically safe. It requires neither active or passive systems nor operator interventions to remain safe, thereby allowing co-location near major industrial facilities. High temperature output that allow direct substitution for fossil fuel use in industrial process heat applications. Much higher efficiency leading to lower energy cost, making it competitive with natural gas in many places of the world today without any price for carbon. Because HTGRs have been built and safely operated in the past and because there are current operational demonstrations in Japan and China, we can say with certainty that the HTGR is the only technology on the relatively near-term horizon capable of displacing the use of fossil fuel for electricity AND high temperature process heat while emitting zero carbon. They are not a long term science project. 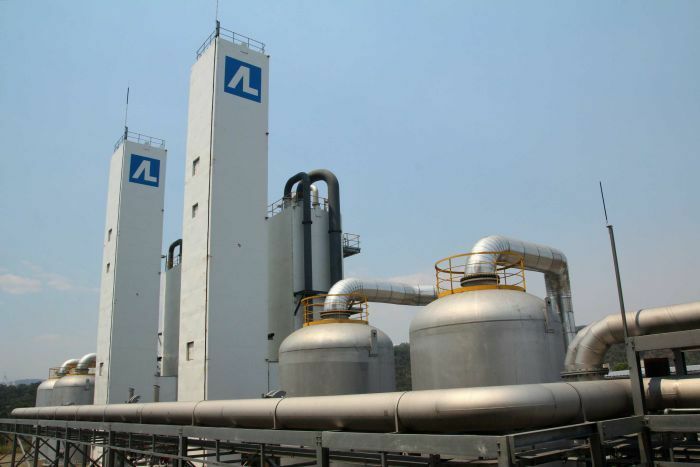 Steve Aplin has a new post at his Canadian Energy Issues blog that foresees HTGR's combining with coal and water to manufacture the liquid fuels of the future. An article from Reuters, on Norway's struggle to get wind capacity built economically, coincided, today, with an article from L Presse in Quebec with the ongoing purchase of wind capacity despite almost identical depressed market pricing and system overcapacity to the extent Quebec pays a Gas Generator to remain idled. Government support is aimed at increasing the return on investments from electricity sales revenues to make wind power economical, but it can fund only a part of prospective investments. "Without subsidies, (wholesale) power prices need to be around 600 crowns ($100) per megawatt-hour to make things fly," Andreas Aasheim, an advisor to Norway's wind energy association Norwea said. But lasting wet weather periods can push power prices down, as was the case this year, reducing the appetite for investment into capital-intensive wind power. Nordic electricity prices are so low that even with the subsidy, the total income from renewable power generation currently is only around $72.9 a MWh, lower than the cost of producing wind power which is between $90 to $110 per MWh. As a result, only one tiny 1.6 megawatt (MW) wind power plant with two 0.8 MW capacity turbines has received green certificates in Norway since a joint Norwegian-Swedish subsidy program was launched in January 2012. My twitter feed is abuzz with news from the UK - 3 links to the same news release. None note the UK alliance differs from a very recent alliance just across the channel, between the oil and gas industry and a handful of renewables firms - prominently including Denmark's Dong energy. The Carbon Capture and Storage Association, the Nuclear Industry Association and RenewableUK have today issued a joint call to the Secretary of State, Rt Hon Edward Davey MP in support of the Energy Bill and the fostering of a low-carbon electricity generation mix, as well as the need for swift progression to ensure that investment is urgently realised. The three associations, representing over 1,000 corporate members, made the request in a letter to the Secretary of State today copied to the Chancellor, Prime Minister, Business Secretary and Deputy Prime Minister and Minister of State at the Cabinet Office. In the absence of more-flexible nuclear output, surplus baseload generation would cause renewable energy to be dispatched off. With Bruce Power’s apparent 2,400 MW of CSVD flexibility, renewable energy will still have to be dispatched off. At the end of 2015, hourly scenarios exist whereby wind could produce up to 6,500 MW - with none effectively consumed in Ontario but at a cost to Ontario ratepayers of $705,000." Aegent previously discussed the challenge presented by integrating renewable energy – particularly wind – into Ontario’s electricity grid. The highly variable nature of wind output is an ever-present challenge and while installed wind capacity is on the rise, flexible coal-fired generation is being taken out of service and being replaced by a much less flexible natural gas-fired fleet. Bruce Power has completed it's refurbishment work as Unit 2 has now joined Unit 1 in achieving commercial operation. In New Brunswick, the Point Lepreau refurbishment project is entering the final stretch on the journey to commercial operation as the Canadian Nuclear Safety Commission (CNSC) is allowing the reactor power to be increased to full capacity. TIVERTON, ON – November 1, 2012 – Bruce Power’s groundbreaking Restart Project was officially completed on Oct. 31 with Unit 2 being declared commercially operational just two weeks after the unit first generated electricity. The return to commercial operation of Unit 2 comes just over a week after Unit 1, which achieved this milestone on Oct. 22. The full media release may be read at the Bruce Power site. CNSC Gives Point Lepreau Final Green Light. Today, the Canadian Nuclear Safety Commission (CNSC) announced its decision to allow New Brunswick Power Nuclear (NBPN) to increase reactor power at the Point Lepreau Generating Station above 35% of its full capacity. This is the last significant regulatory milestone before NBPN brings the reactor to full power and normal operation. I've noted before this project was not intelligent - converting a plant that operates very infrequently with coal to one that runs infrequently on gas. The units are sized such that the appropriate conversion would allow co-firing of the units with biomass and coal. Ontario’s Liberal government has suspended plans for another natural gas-fired power plant — this one in Thunder Bay. But energy minister Chris Bentley says halting the project could save the province close to $400 million, rather than costing money for cancelation. That’s because the plant in question, which now burns coal, belongs to government-owned Ontario Power Generation. Unlike the cancellation of power plants in Oakville and Mississauga, there are no private developers to pay off. Related: Parker Gallant's Some Provincial Liberal Seats are Worth More. I support the thesis that coal-fired generation is currently the better match for renewables due to better peaking depth than the cleaner combined-cycle gas turbines that people argue to be a cleaner form of traditional generation. The economics aren't irrelevant, but investment is going up and emissions are going up for more reasons than coal is cheaper - coal may also better in supply mixes burdened with significant intermittent supply. Burning coal has contributed to a 10 percent increase in EU carbon-dioxide output this year through September, according to Bloomberg New Energy Finance. First-quarter emissions from power generation in the U.S. dropped to the lowest since 1992 because of increased gas usage and a milder-than-normal winter, the EIA said in an Aug. 1 report. EU emissions are rising even after the region received more than double the investment in clean energy sources that the U.S. got this year, at $61.7 billion versus $27.8 billion, BNEF data show. Since 2004, the difference is $511 billion versus $250.9 billion. Are Fossil Fuel Subsidies Really the Problem for Renewables? With current events dominating the news cycle, and particularly with the scandals in my own province's electricity sector, it's easy to miss the important ongoing works from the best economists in the energy sector. 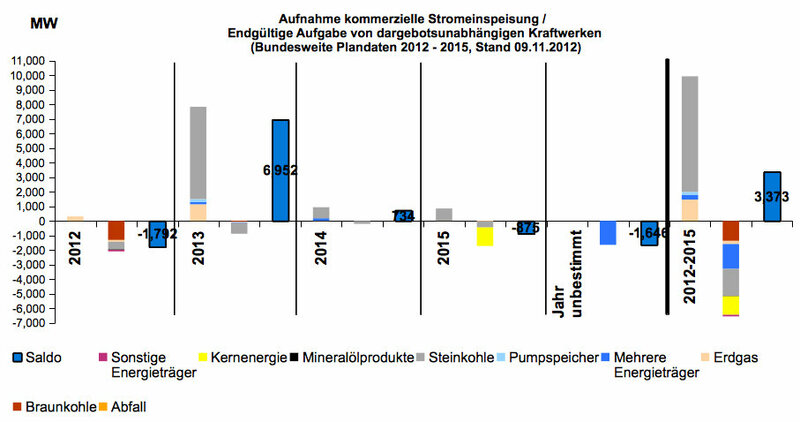 I'm a fan of Severin Borenstein, who recently posted a short blog entry explaining how fossil fuel subsidies aren't to blame in renewables failing to be perceived as competitively priced. I had a great time last Friday at Berkeley’s Annual Energy Symposium put on by the Berkeley Energy & Resources Collaborative. Interesting people, interesting talks, and great to catch up with former students who are now working in all parts of the energy industry and government agencies. I particularly enjoyed the session I got to chair on subsidies/support/incentives (everyone has a different word) for renewable energy. But a number of times during the day I heard the common wisdom that the subsidies to the fossil fuel industries are a major barrier (some said THE major barrier) to the success of renewable energy. If only it were that simple. Unfortunately, the common wisdom isn’t correct. Subsidies to fossil fuel companies are bad public policy and should be ended, but they have no meaningful impact on the competitive position of renewables.